As we mourn the loss of Ernie Michel, we also pause to honor his memory during Jewish American Heritage Month. With over six decades of dedicated service to the Jewish community, Ernie was a true Jewish American leader. 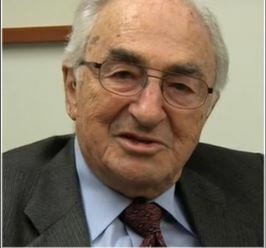 In 1947, he joined the United Jewish Appeal, and was their executive vice president from 1970-1989, where he was instrumental in the merger that created the UJA-Federation of New York. Read more about the inspiring, and amazing life of Ernie Michel. A memorial service was held today at Plaza Jewish Community Chapel. Those who wish to further honor the memory of Mr. Ernest Michel may do so by clicking here to make a contribution to causes he believed in. May his memory be a blessing unto to all those who treasure it.